It is with great sadness that on 11/11/14 our father, grandfather, great grandfather, uncle and friend, passed away. He was the anchor of the Knodel family and will be missed. Donald Clayton Knodel was born in Chasely, ND and raised in Hurdsfield, ND. He was one of 8 children and lived there until he joined the Navy, where he served in World War II on the USS Howard W. Gilmore. He came home and married Audrey Jean Kelm, his wife of 64 years. Together they took a leap of faith and with their two young children moved from ND, to West Seattle where they lived out the rest of their lives. Don owned and operated Dons Barber Shop on California Ave. for 45 years. 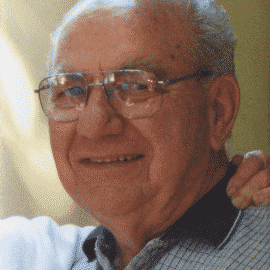 Sports were his passion, playing baseball and basketball in school and in the men’s league in ND. He was a avid fisherman, and bowler at the W.S. Bowl, involved with the W.S. Little League Baseball as a umpire. He and Audrey were Totems hockey season ticket holders, and original Seahawks season ticket holders, Don loved having family and friends around him, whether it was playing cards, dancing or just sitting around telling stories and laughing. Lot’s of laughing…. Preceded in death by his wife Audrey, 3 brothers Durward, Al, Andy, 2 sisters, Doris and Joyce. He is survived by his children Dwight (Nik), Kath (Kelly), Pam (Tom) grandchildren Erin, Damon, Tyler, Ian, Kaley, 6 great-grandchildren, 2 sisters Opal, Irene and countless friends and family who will miss, but never forget him. Service: 11/21/2014 2pm Forest Lawn Funeral Home 6701 30th Ave. S.W. If you would like to donate, please do so to the Alzheimers Foundation. Healgrief has a memorial to share with you. https://healgrief.org/donald-clayton-knodel-11112014/ We invite you to express condolences, share special memories and photos and light virtual candles to honor and celebrate the life of our loved one. We also invite you to share this with others who may want to be notified as well. You may do so by sharing the link or by clicking the “Share this Memorial” button from within the memorial itself.